The High Mobility Multi-purpose Wheeled Vehicle (HMMWV) nick named the Humvee is a replacement for the M151 series of jeeps. 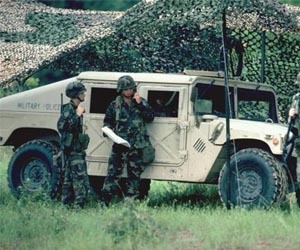 The Humvee is widely used as a work horse and fighting vehicle of the US army. The M1109, M1114 and M1043 HMMWVs are the ones depicted in GR. These versions are armoured against small arms fire and mines by having armour on both sides and underneath. A weapon mount is located on the top of this version of Humvee and can mount a range of weapons including, M60, 7.62mm machine gun; M2 .50 calibre machine gun; or the MK 19 Grenade Launcher. This "turret" style design is controlled by peddles and can turn a full 360 degrees. This type of Humvee can climb a 60% slope and traverse a side slope of 40% with a full load. It cans cross-fords upto 30 inches deep and with a fording kit can go to 60 inches deep. The high front means the Humvee can climb obstacles that may impede a normal vehicles path. The more armoured versions of the Humvee are used as reconnaissance vehicles. They can provide the commander with up to date information, scout routes, zones and areas, prevent surprise attacks by the enemy and maintain the free movement of the rest of the group. These are made possible by the speed stealth and mobility of the Humvee. The Humvee has a small profile compared to a M3 Bradley this means it can go closer to do a more detailed recon of an area. The Humvee is also used to protect lines of attack by giving early warning; they are also used to set up observation points. The Humvee is not used only as a recon vehicle. It can also be used in the role of Anti Tank, when equipped with a TOW missile launcher it can get into urban environments and stalk tanks picking them off and moving on. It can also do it in open country as well but at a great risk due to the lack of protection against high calibre fire. The speed is its advantage in the open ground and low profile. The Humvee series M1109 and M1114 HMMWVs were designed on the basis of the fierce fighting in Mogadishu in 1993. The Humvee's there were the standard un-armoured versions; a lot of soldiers were killed whilst in the Humvee's from small arms fire. The US government seeing that this could be the future warfare they may be engaging in decided to upgrade with Kevlar armour capable of stopping 7.62mm round and armour on the underside to stop mines containing up to 12 pounds of explosive. A large amount of these M1114 were sent out to Iraq and have been used well in the Urban Environments of Baghdad but the armour on them can't protect them from RPG's which is the weapon of choice been used by terrorist in Iraq. The armoured or armoured up Humvee as it is called is still a reliable measure and already has saved lives in Iraq and the US government has been pulling hundreds of M1114s from Depots and units around the country so they can ship them to Iraq were a lot of National Guard Military Police units are still with out them. The M114 is still favoured the most by Recon troops and this is one of its major roles. The Humvee comes in over a dozen different configurations. The M998, M998A1, M1038 and M1038A1 HMMWVs are troop carrying Humvee's. The cargo carrier configuration is capable of transporting a payload (including crew) of 2,500 pounds and the troop carrier is capable of transporting a two-man crew and eight passengers. The M1097is as another transport version with a soft top extended rear cargo area and improved gear ratio to help pull the increased load it can carry of 4,575 pounds. This version is still equipped with basic armour. The M1043 and M1025 are both the standard type Humvee�s and the M1043 has the latest upgrades. The M1037 is a sheltered carrier configuration of the Humvee with a large solid container area on the back that can house more cargo. The M996, M996A1, M997, M997A1, M1035 and M1035A1 HMMWVs are all configured for Ambulance work and can transport patients from the front line to hospitals. The M996/M996A1 are designated as Mini-Ambulances and can transport up to 2 litter patients, 6 ambulatory patients or a combination of litter and ambulatory patients. The M997/M997A1 are designated as Maxi-Ambulances and can transport up to 4 litter patients, 8 ambulatory patients, or a combination of litter and ambulatory patients. The M1035/M1035A1 are soft-top Ambulances and can transport up to 2 litter patients. The M996A1, M997A1 and M1035A1 also have the latest modifications. All these Humvee�s are equipped with a self recovery winch. The Humvee is the world standard in jeeps and has proven to be invaluable to forces and has show it can be highly adapted to many roles in an army. Its service life has many years left and some cannot see an end for the HMMWV affectionately called the Humvee. Primary function: The HMMWV provides a variety of wheeled vehicle platforms. These are cargo/troop carrier, armament carrier, TOW missile system carrier, shelter carrier and two ambulance variants (2- and 4-litter). The HMMWV will also be the prime mover for the AN/TRC-170 Radio Digital Terminal and the Pedestal Mounted Stinger System.